Rotary File for November 10, 2015 | Rotary Club of Iowa City A.M.
Casey Cook led a "What Jazzes You Up" session about Rotary Foundation with Jim Peterson and John Ockenfels for the Nov. 10 AM Rotary program. Myrene Hoover reminded us that Wednesday is Veteran's Day originally set to mark the end of World War I on the 11th hour of the 11th day of the 11th month in 1918. In 1938 it became an official holiday and in the 1950's the day was expanded to give thanks to all our veterans. Myrene also noted that we have received thank you notes from NAMI, Elder Services Meals on Wheels, and DVIP for local grants the club has given these organizations. Don't forget that the Month Opener for December will be a chili supper on December 7th at Peggy Doerge's house. There will be a mini-version of a fireside chat that evening. The Fireside Chat will give newer Rotarians a chance to learn about some of the programs, activities and areas of service within AM Rotary and Rotary in general. Several members discussed the impact of the changes taking place in the PolioPlus program. The most common polio virus, Type 2, has been gone for almost three years and when it has passed the three year mark world health bodies will end the live virus immunization. There will still be a clean up for the remaining strains for another two years before polio is declared completely gone. Mark Patton is distributing a sign up list for the December 5 distribution through the Consultation of Religious Communities of presents for kids to give their parents. The distribution will take place at St. Marks Methodist Church. The District 6000 Foundation Dinner was very successful except it was too cold to do much of a balloon liftoff and the winners of Foundation points were instead chosen through a drawing among the balloon providers. Brian Adamec was one of the winners. Jean Knepper was featured in a picture having to do with the publication of the "Live Like Line, Love Like Ellen." We had time for seven or eight Rotarians to share happy buck moments. 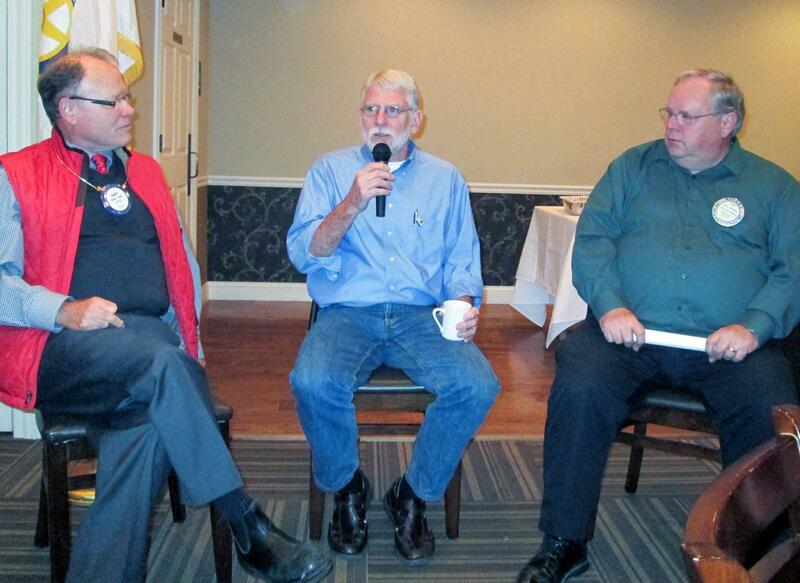 Casey Cook moderated a discussion about Rotary International Foundation with Jim Peterson and John Ockenfels. The Foundation is not the same as RI itself. RI is the administrative arm of Rotary. The Foundation is the heart of Rotary because it provides the funds for Rotarians to do what Rotarians do in both local and global service. Of the funds we send to RI Foundation half comes back to the District three years later. Nearly 100% of all funds raised by the Foundation go to supporting projects either at the global or the local level. About $430,000 goes from the District to RI Foundation each year, so a little over $200,000 comes back for local use within three years. Projects need to fall into one of six broad areas: world peace, fighting disease, providing clean water, protecting the health of mothers and children, supporting education and literacy, and helping grow local economies. Our club has supported water projects, most recently, in Paraguay. Early on, Foundation funds helped to get the Xicotepec project started, and helped to get fire trucks and ambulances to Central America. Now many of the projects that the Foundation previously would have funded are no longer large enough or sustainable enough to pass muster. Some of the older and smaller projects, for example some of the single wells put in place, are being reexamined to make them more sustainable and to perhaps extend them to serving more villages. The new grant rules do allow for supporting Vocational Training Teams. This is a way that the new Rotary Action Group (RAG) for the Clubfoot training initiative may tap Foundation funds. One of the projects DG Miller has asked each club to support is to provide funding for braces to be taken back to their home clinics by the doctors trained in the Ponseti method.